With the A1’s furious debut two years ago and the evolution called AF9 last year, Sony has made an impressive debut in the OLED segment. Now the manufacturer is consolidating its portfolio with the AG9 and adopting the unconventional design of its predecessors. The most notable change in the design concept concerns the foot construction, which has lost extravagance compared to A1 and AF9 and has been adapted to the general standard instead: On the back side of the OLED panel there is, as usual, an attachment that accommodates the electronics, to which the actual foot is attached, which on the AG9 is designed as a solid plate towards the front. This means that the display of the predecessor models, which is slightly tilted backward, is now a thing of the past. The AG9 is positioned at right angles to the floor. Sony also offers the option of a new bracket for wall mounting, which can even be swiveled. The distance to the wall is now much smaller thanks to the changed foot. Also worth mentioning is the fact that the AG9 is the first Sony OLED TV in 77-inch format since the original A1 model. 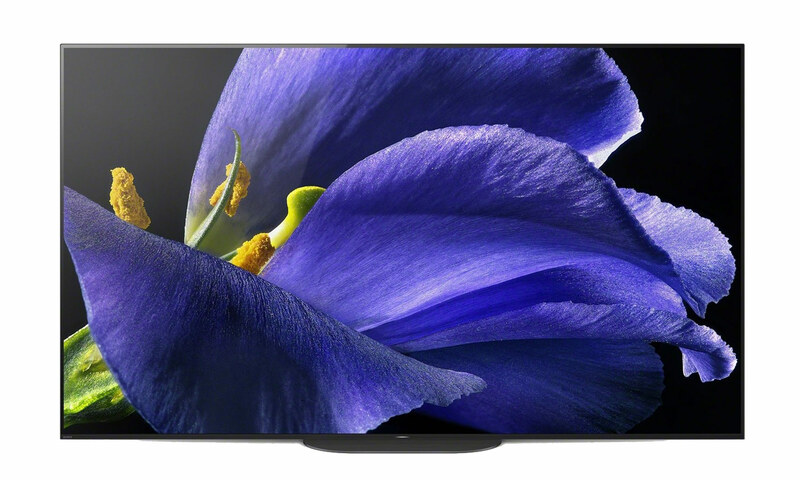 The OLED display of the AG9 is state-of-the-art and is controlled by Sony’s X1 Ultimate processor, which already proved its capabilities in its predecessor AF9 and presents an excellent picture regardless of whether it is a normal TV signal, HDR content or streaming in “Netflix Calibrated Mode”. This is partly due to a series of image enhancement programs that, for example, sharpen individual image objects or optimize colors and contrasts. Finally, to get the last bit of image quality out of the AG9, it can be calibrated with the CalMAN tool. The highly acclaimed Acoustic Surface Audio+ technology, which uses actuators to set the screen itself vibrating, is also used in the AG9. The sound generators, however, have been further developed, resulting in a slightly different configuration. While the AF9 uses a 3.2 setup and the subwoofers are located in the foot section, the latter are now on the rear of the unit and only two of the improved actuators have been installed. The TV can still be integrated into a surround system, the AG9 also has a loudspeaker terminal and the “Centre Speaker Mode”. The remote control, which has become even clearer, has also been revised. In conjunction with the nimble Android 8.0 (Oreo), navigation through the unified and better-sorted menus is effortless. The big video streaming providers are of course all on board, but the announcement of the Apple AirPlay 2 support, which will be updated in the course of the year, will make you sit up and take notice musically. Sony hasn’t been ambitious in recent years with innovations, now it was obviously time to shift down a gear. The major innovations are missing, but several detail improvements have been made and the new design makes Sony’s OLED offer interesting for all those who prefer a more discreet TV concept. All in all, the Sony AG9 delivers a strong appearance in a new look.